A few months ago, as I moved into my new home in Austin, I was feeling rather bold. I had a bit of a deck that went out into a creek and loved it. But it needed something a bit more lush and romantic to feel truly finished. I had this one spot in particular along this fence that needed plants, and I couldn’t find a planter that was the right length and height that didn’t cost a bazillion dollars. Then one night I was having a meal at one of my favorite local spots called Contigo, and I noticed a nice long and tall planter… quite a lot of them actually, all around the restaurant. “Where did you get those? !” I exclaimed to the restaurant people. 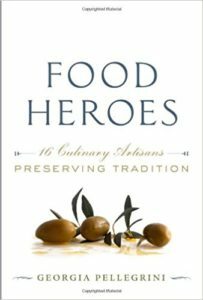 “Oh, the restaurant owner built them himself,” the restaurant people replied. I got up from my picnic table and walked over to the planter in the parking lot and inspected it. Then I circled around it intently. Then I circled around it some more. “I can do this!” I exclaimed again to the restaurant people. “Okay, here’s your pig brain pâté,” they said. And so I did it. I made my own planter. And while I’m not a carpenter by any means, and I encourage all of you carpenters to add your recommendations in the comments section below so we can improve upon this version, I thought I’d show you how I did it, in case you want to take matters into your own hands too one day, and make a planter for a few dollars, rather than a few hundred. Here goes! I made my life a little tricky because I had this big piece of wood already leaning on the side of the house and I decided to build around it. It turned out to be very hard wood and slightly warped, so if I were to do it again I would get softer fresh wood and start new. And cut the wood yourself. It makes your muscles very, very nice. At least in one arm. 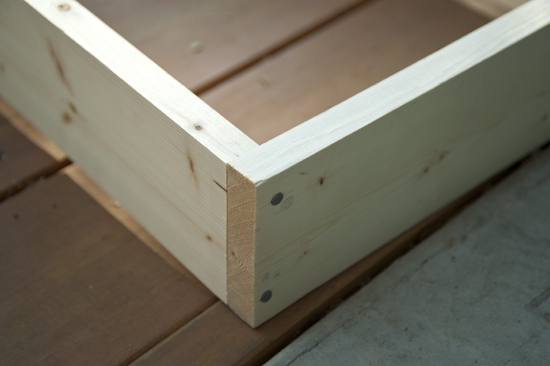 This is the base pine frame… I liked pine because it was cheap and soft. This is going to hold the base board I have lying around. Like so. Then it is going to get hammered on all corners for security’s sake. Then in go the posts on all four corners. Use a big heavy hammer my friends. Those light dinky ones are no use. Some more daring people might even use a nail gun. But they scare me so I stayed old fashioned with my trusty hammer. So this is where we are now (wave to my Big Green Egg). I need to work on my hammering skills. But mostly you can see that having a slightly warped base made it hard to keep things in alignment. Learn from my mistakes friends! You can see at the far end that the pieces aren’t attached yet. They’re dangling. It would help to have a second set of hands help you hold up one end while you hammer the other. You’re going to have marks on the wood to help guide you but it still helps to have a second set of hands to steady things. When all of the slats are attached, it will look like this! That’s when you get this out. You could use paint too, but I liked the idea of sealing it against the elements and also giving it a little stain. You’ll want to use a few coats until it is the color that you want. You don’t really need to do the inside because it will be covered. Then you’ll let it dry overnight. And then you begin to line it with planters fabric. You want to make sure you’re liberal with it and overlap the lines so that it limits leakage. 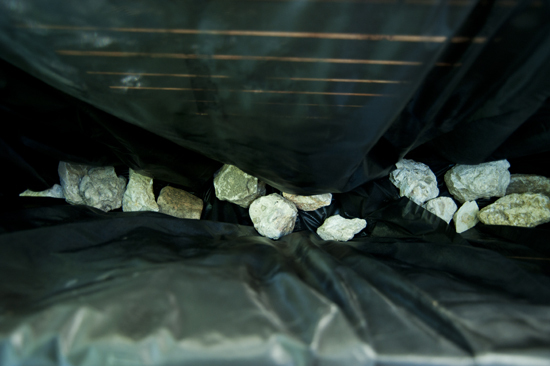 Then you should add a few large rocks to the bottom if you have them so that it helps with drainage. Then get out your soil. Fill it 3/4 of the way up, add whatever plants you desire, top it off and water, water, water. I planted bamboo and since taking this picture, it has turned into a giant, lush, green wall. I love it, it makes me feel like I’m in a jungle. The planter is not 100% perfect but that’s why I like it… it’s 100% mine. Create a frame for the base by hammering together two 83-inch pine pieces with two 13-inch pine pieces so that you have a narrow rectangle. Drop the bottom 2 x 11 x 81 piece of lumber inside the frame. Hammer the frame into the base piece on all corners. 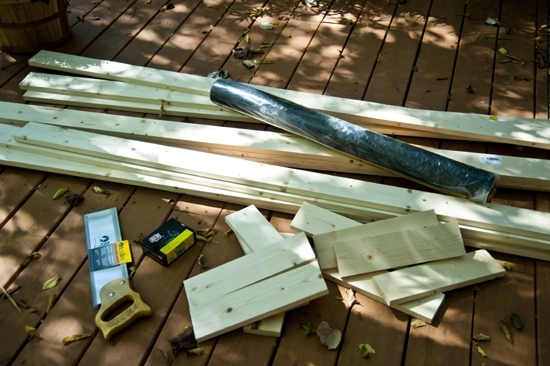 Add the four 2 x 4 x 27 pieces of lumber, one at a time to each corner so that they stand upright. Hammer them in on all corners so that they stay secure. 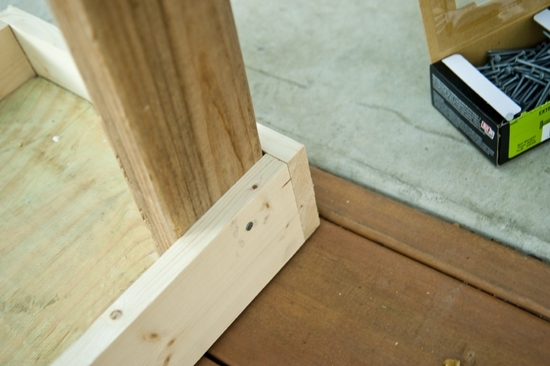 With a measuring tape and pencil, mark the posts where you will add additional slats. 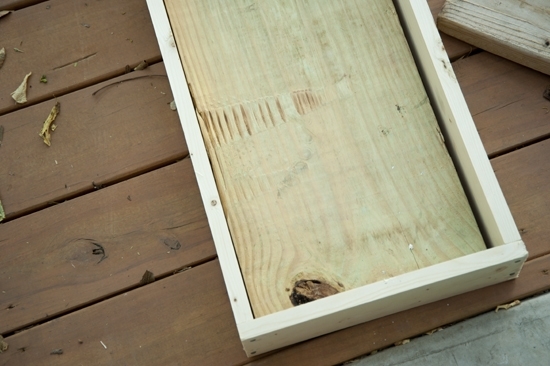 Start at 1/2-inch above the frame pine board and mark 1/2-inch, 3 1/2-inches, 1/2-inch, 3 1/2-inches, etc until you reach the top of the posts. This will tell you where to nail the pine slats and ensure that they are even. 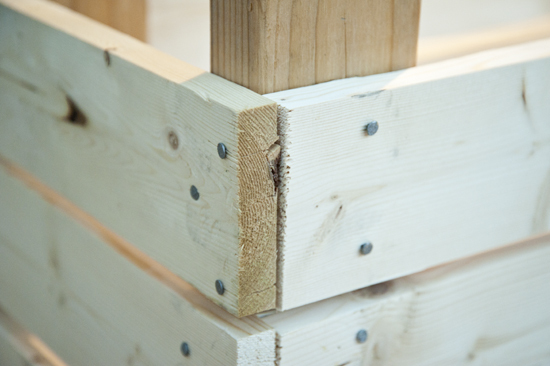 You will be left with a slat that is 1/2-inch above the posts which looks nice. 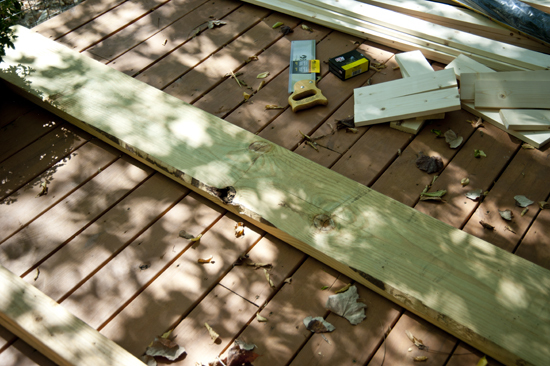 Begin nailing in the slats on all sides, making sure the pine boards go in the spaces that have been marked for them. It will help to have a second set of hands to help you hold up the one end while you hammer the other. Or a good clamp will work as well. Keep going until you’ve hammered in all slats. It may take a while if you’re hammering by hand rather than with a nail gun. Take some ice tea breaks and know that you’re getting some good arm muscle. Once it is fulling hammered together, lay some plastic garbage bags or drop cloths around the base. Stain the wood with a sealant so that it doesn’t get water damage. 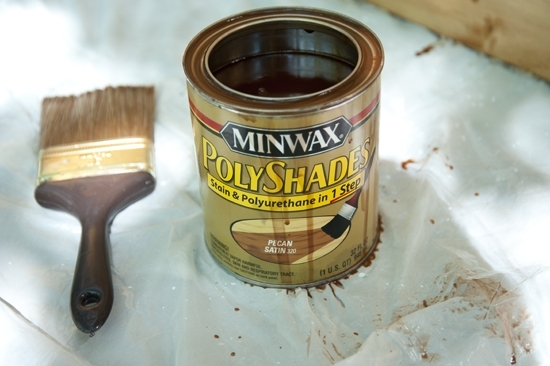 I combo stain and polyurethane is an efficient way to make it look finished and protect it at once. You really just need to focus on the outside, since the inside will have planter fabric and plants. Let it dry. Once dry, line it with planters fabric, drop rocks at the base for drainage and fill with dirt. Plant away! Make a sketch of your planter and the dimensions first so you have a clear picture of how it will look and where all of the pieces will go. If you buy your wood from a large home repair store like Home Depot, they will cut your wood for you to your desired dimensions so you don’t have to do it at home with a hand saw. 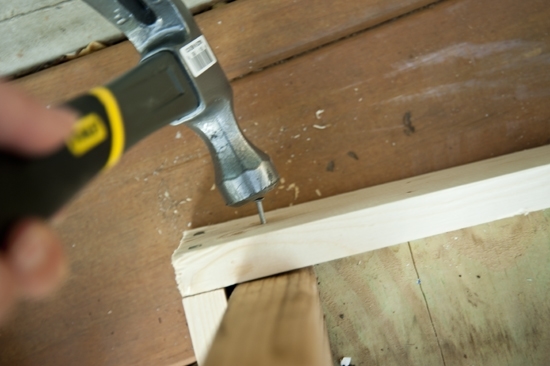 Use a soft wood if you plan to hammer by hand and use a heavy hammer to give you some weight when you bang the nails in. A dinky hammer won’t take you far and you’ll have a tired arm. I LOVE this Georgia!!! I’ve been looking for some planters to put along my back fence. I’m a Pennsylvania mountain girl living in the city in TX and my neighborhood is woefully lacking in greenery! I love the width of the planter as it will not take up much of the yard. I also love the bamboo as it shoots up so quickly – I’m stealing this whole idea!!!! Thanks again Georgia! That’s great, I’m so glad it will come in handy for you! 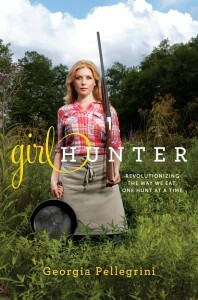 Well Georgia, I think you need to add a Girl Carpenter book/category into the mix! First of all, your finished product looks amazing. I am planning on making a modified version of your planter, and I have a few questions about your directions. Can you confirm that you used one by four boards for your slats? 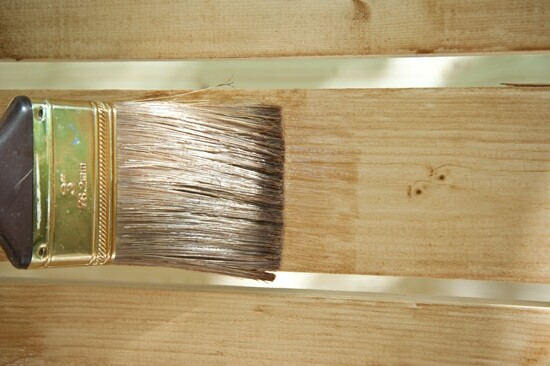 In the photo with the paint brush, it almost looks like the slats are closer to the size of the brush, which is three inches. Also, when you describe marking the upright posts, it seems that you are indicating that there should be a two inch space between each four inch board; however, the math doesn’t work out. Eight slats at four inches each and seven spaces at two inches each would need a forty-six inch upright post. 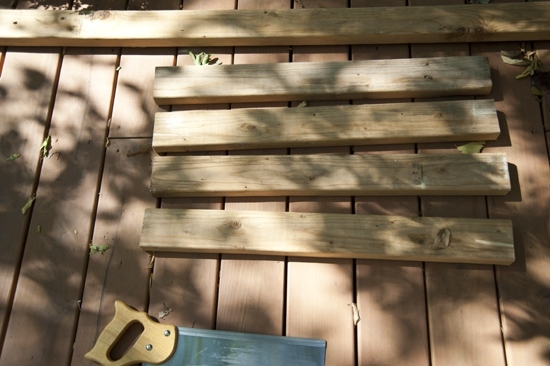 In addition, the spacing between the slats appears to be much smaller than two inches. Of course, it is completely possible (read: likely) that I am totally missing something. I really like the way your planter turned out, and I am hopeful that mine can look as nice. 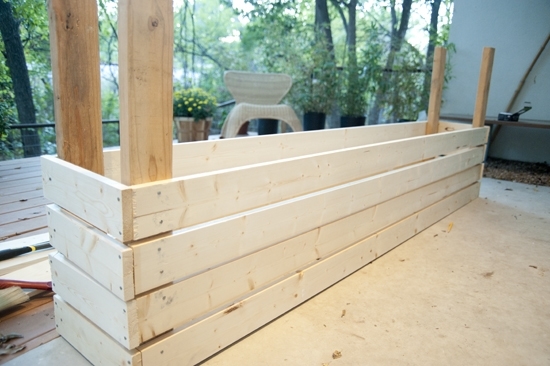 If possible, can you confirm the size of the slats and spaces in your finished planter? Hi Mary! I’m so glad you’re going to make one of your own. It is a bit confusing, I agree… basically Home Depot and other lumber places refer to the pine slats as 4 inches wide but they are really only 3 1/2 inches. They told me that at the time but it definitely confused things a bit. Also, since the posts are sitting on top of a 2-inch baseboard, it raises them all by 2-inches. Also, the first pine slat is going to be starting at the bottom of the 2-inch base as well so you’ll lose 2-inches there. One way I gave myself wiggle room this is that I allowed the pine slats to come above the posts at the top, meaning they didn’t have to be perfectly flush. As for the spacing in between the slats, you’re right, it’s only 1/2 an inch, I fixed that in the directions, thanks for pointing it out! 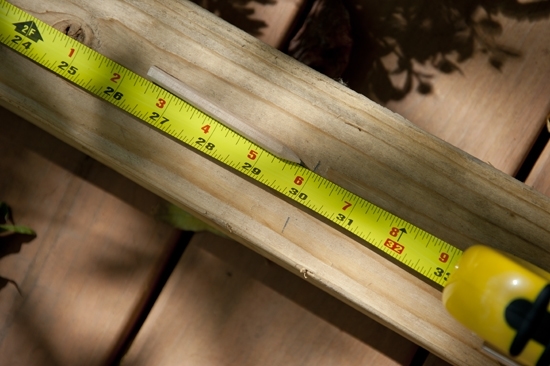 So with that starting at the ground, you’ll get 31 1/2 inches in slat height by measuring 3 1/2 inches and then 1/2-inch, which means you’ll need a post that is 27-inches to compensate for the 2-inches you lose in slat height and 2-inches you gain in post height. This will leave you a 1/2-inch of slat overlap at the top which I think looks nice. If I were you, I would decide what kind of wood you want to use at the lumber store after seeing what they have, take true measurements and then draw it out. I’m not very good at math so a drawing really helped me. Let us know how it turns out!!! I just finished my planter, which is based solely on your directions, and I am quite pleased! I made some slight adjustments in terms of dimensions and materials used; however, it is pretty true to your original plans. My finished product is six feet wide, thirty-two inches high, and thirteen inches deep. I used pressure treated wood, as the planter will be exposed to all the elements of a Northern state. In addition, I used a drill and exterior/decking screws to put it together, which made things a bit easier on my arm. I also used spacers when clamping my boards down for drilling, which resulted in less measuring and fretting about lining things up. While it isn’t perfect, I am really proud of the finished product. I wanted to thank you for your inspiration and help. The thing that I loved best about your approach is that it is simple. I found so many plans that were overly technical and required thousands of dollars worth of insanely dangerous power tools. I purchased the landscape fabric, but I still have to install it and fill it up with some soil and plants. I bought a high quality fabric, which is designed to let air and water in. Therefore, I am afraid that it will let the water out and leak all over, kind of like an unlined coco basket. Have you had any problems with watering? Would you recommend a more plasticy lining, or will I be okay? I do have to wait six months to a year to stain it, as pressure treated wood need to be allowed to totally dry out from the chemical process it underwent before applying stain. I guess I just have something to look forward to! Since I had such great success with the first one, I am going to build a second planter to completely line my twelve foot patio. My hope is that with the additon of running bamboo, I will be able to grow a dense privacy screen. Hi Mary! I’m so happy it has worked out for you. I used the planter fabric they sell at Home Depot and it is very much a fabric, not plastic at all. I water constantly and haven’t had any problem with leakage. The bamboo screen is pretty awesome now, I should show a more current picture here 🙂 Send us more updates here! Thank you so much for posting this super informative and easy-to-build planter post! Can’t wait to start planting my trees soon! Oh that’s so exciting!!! I’m so happy it worked out for you. I have been looking for a planter and came across your site and saw your planter. It is EXACTLY what I imagined how I want mine! I can’t find this anywhere so I am going to build it this holiday weekend. Your instructions are very detail and I admire the pictures and captions. One question: How do you keep the lining inside the planter? Did you glue it? Nailed it? If you nailed it I don’t see signs of nail near top of your planter ?! On step 7, you only have one sentence for this step: “line it with planters fabric”. Could you please clarify how you keep the liner inside? This will be my first carpentry project so I will be following your instructions to the T! Hi Pretz, I held the fabric up on either side while I dropped in the soil and the pressure of the soil kept it in place. BUT, you could certainly use a staple gun or some other “tacking” measure to keep it all in place when you drop in the soil. It would certainly be easier. Let us know how it turns out!! Go you for trying it! Planter boxes are a great way to add garden elements where you might not have the best of soil conditions. Wooden boxes are attractive, but you’re limited to square or rectangular boxes, and they take some time to put together. 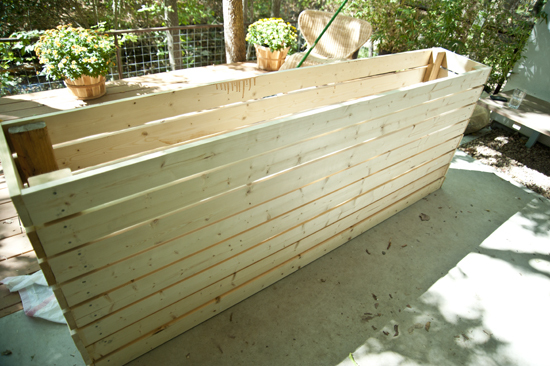 You can build a concrete planter box, like the ones shown on Yard Crashers, and make different sizes. The blocks come in a lot of different colors, too and they are easy to move around. There are instructions and a video here: http://info.basalite.com/build-your-own-stone-planter-box. Happy Gardening! Welcome to Austin! You are a lucky, lucky woman to have chosen this summer instead of last to move here. I’m sure you’ve heard that before. Austinites seem to take a strange pride in their ability to withstand the heat, much the same way Wisconsinites pride themselves on withstanding the cold. Your planter box looks professionally made. Good job. This is awesome! I was looking for some encouragement and you gave a massive dose of it 🙂 Thanks much!!! I haven’t had any problems, but feel free to reinforce with a 2×4! Looks great! My husband and I are inspired, but putting together plans for our own space we ran into some confusion. 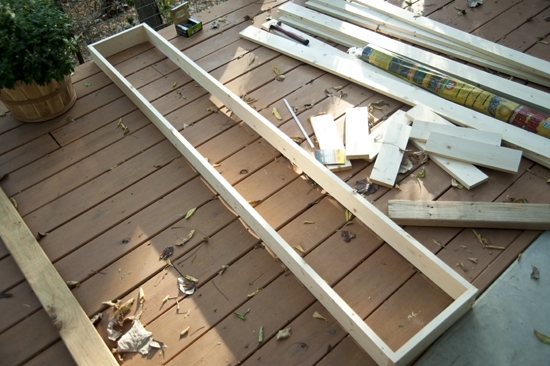 Why is the base board (79 inches) four inches shorter than the long side slats (83 inches)? Looking at the close up picture, it seems that the long side is the same length as the baseboard, with the short side wood extending an inch longer on either side, to be flush with the outer side of the long board. Where does that extra 4 inches go? It should be 81 inches not 79 inches. Thanks for correcting that. I’m bad at math! I fixed it. This is a perfect looking planter that I’d like to make for my deck. Before filling the planter, did you make any holes in the planter fabric for drainage or is the fabric designed to allow some drainage? It is planters fabric which is designed to be breathable! You can get it at gardening stores. That planter looks awesome! How much did this project end up costing? Your wood must be more a expensive variety than mine was… which means it will last longer. What brand is your planter fabric? I’m looking for some online but I’m not seeing anything that looks like yours. If you ask at Home Depot or another gardening store for planters fabric they will lead you in the right direction, mine was just what they had at Home Depot. You inspired me to build my own planters. I didn’t follow all of your directions, I used deck screws instead of nails and I made my planters 5 feet long instead of the 6 1/2 feet you did. Looks awesome! You did a great job and I’m glad you modified them to suit your needs. Thanks for the post Georgia, I am going to make a planter with my two girls. If you are in the holiday spirit, you have to check out 35th street for the funky Christmas lights. Please tell me they still keep that tradition alive. Thank you for sharing. I had an idiot neighbor that built a dog house and put it by my living space on her side and I need something to plant and hide the darn thing. I love dog houses but not when you place it by someone else’s living space. but and I have the perfect spot for a planter box. I am very creative. May I use your idea?. If so, I think i will build me one. Thank You! This is wonderful! Way to go! It is very stylish yet simple and effective. I want to create a bamboo privacy screen and this might be the ticket. Thanks for the inspiration and the detailed pictures and process. I believe my bamboo was golden goddess or golden dragon, something like that. And the cost for the planter materials was somewhere in the range of $50, it’s been a while! First, can we talk about the pig brain pate ?? Your planter is awesome and I applaud you for figuring it out and doing it yourself !!! (Standing applause here). Since the wood will absorb moisture on all four sides and the ends (especially pine), it wouldn’t hurt to seal the entire structure. Warping would be the most obvious fault. I can’t stand the noise of hammering so I use screws whenever possible. I would use exterior screws or nails in any case. Again, it’s the moisture issue. It may take a while for the nails to fail, but you may get rust stains on your beautiful project. The last thing I will mention is sanding the end grain. 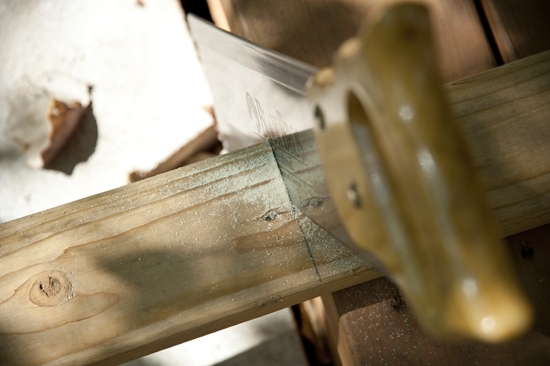 It will make your project look nicer by smoothing the ends of the planks and by bringing out the ring structure. The stain you apply will further enhance that. Thank you for sharing your project and all the best !! Hi! I love this idea, and the results! I have a suggestion to add… with the cost of things these days & everyone trying to do the “green” thing. and a could do this and just have to buy a few things. The boxes would be smaller in length of course, and the stain would just cover the imperfections or add to it, creating a barnwood effect. What a great idea. Thank you fo the simplicity of this idea. I also like the idea of the screws instead of nails as over time, the nails could back out, and the screws also make it easier for a person doing this alone. could even predrill the holes a little to keep the wood from splitting s close to the end of the boards. Great idea Mindy! I have seen pallet wood used for walls even. I have a 15 x 22 foot deck as my back yard, which like ypur self borders a river. Yesterday I ws away and saw these grat wooden flower boxes someone made as a border. I looked at them and thought, I can build that as a solution to me wanting 1- a border for my deck and 2- flower boxe to plant more bushes and flowers.. This morning I googled “Building a 5 foot flower box” and ypu beautiful flower box with description of how to build as well as a list of supplies showed up. Your description is great, your list of supplies is great, your photos were great and most of all your flower ones came out beautiful. So glad it was helpful Dan! Happy building and planting. Is it possable to put ply wood instead of that fabric stuff? If you paint the ply wood do you think it would still rot? 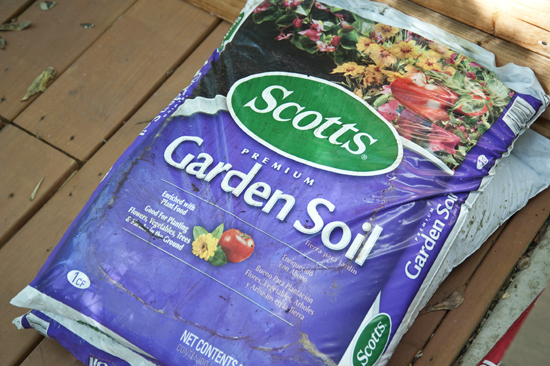 You need drainage for the soil, and the fabric is breathable which is important for healthy roots and plants. 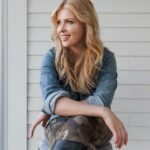 Georgia – you are officially my hero! I need several planters and knew I would have to build them due to the cost of premade ones. I came across your instructions today and they blew me away because this is exactly what I need. I have limited carpentry skills but intend to learn so much more and there is no time like the present. Wonderful! I’m so glad you’re going to roll up your sleeves and do it! We are doing this project tomorrow. Planting cucumbers against a ten foot trellis. Fingers crossed. We’ll let you know. Stumbled acrosstgis while searching for ‘diy planters’. At first I thought a guy had made it so was even more imprssed a woman had (that was meant as a compliment:). Great job from UK! You must be new…we’re a bunch of fearless girls over here! There’s more where that came from 😉 Enjoy it! Couple questions…first, I know this might be a stupid question, but what about the drainage in the bottom of the box cause the water can’t just collect there on the bottom, right? 2nd, I really don’t have any dirt or space in my back yard unfortunately and I want to build this box so I can plant a few chinese elm trees that I’m growing for bonsai from seeds. There are about 1-2 high now, but I was told they need to be in the “ground” for a couple years for the trunks to get width. There are so many holes in between the slats on the sides that drainage has never been a problem. The wood is also porous. Might try this…Love the look! I’m going to use empty, capped, plastic water bottle in the bottom. It will be lighter weight and will still provide great drainage. Looks great! Do you think the stain/poly could affect the soil in the longrun? Especially if you are planting edible veggies and herbs? Your planter is fabulous. I am building 2 to be part of the rail of my deck. 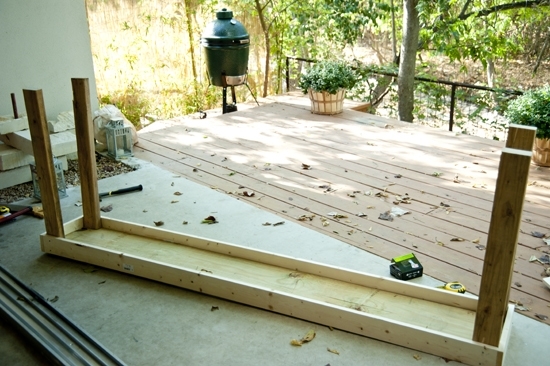 How do you attach the planter to the deck securely? It doesn’t need to be attached to the deck, it sits there on its own and is very heavy so it doesn’t move. Enjoy! I know it’s been a while since you pisted this. It looks fantastic! My Husband just built me a similar one and i just put plastic liner and am debating on whether to put holes in the bottom for drainage or not? I haven’t put the soil in, but this is the time to decide. I’Ve heard gravel is enough and other people say that the liner needs holes. Opinions? I just wanted to cauTion readers that Bamboo is very agGressive and can eScape planters that are not lined with metAl or concrete. You never, never want to try to battle this plant’s encroachment on your yard (let alone a neighbor’s … They will despise you for introducing it!). You will Have a jungle needing extensive digging and poison. Typically, Advice for planting in the ground is a 6-foot deep trench lined with metal. If contained in a prOper planting box “prison,” it is Lovely. Dont let it Escape! If you want it to last a little longer, consider using cedar. It is a rot resistant wood and won’t decay as fast as the wood shown in the example. If you plan to grow anything edible, DO NOT use pressure treated wood. The chemicals in the wood will leach into the soil and thusly into your food. Not good. Great tip! This was just intended for bamboo but you’re right that you should consider what you plan to plant. Built one today and it came out great! thank you very much for taking the time to do this. stain and seal tomorrow. Hurray! I’m thrilled it worked out for you. Tell us any improvements you made so we can learn from each other. Just wanted to know how well this container held up. 1-2 yrs or longer? And steve says the depth of this container isn’t needed, so what is the best height to have when building a bamboo container? Thank you! We Built our very own yesterday! The stain is drying and we can’t wait to put it in place and add plants! This is great!! fellow texan here (Dallas) and wondering how often do you have to water this during our summers? i imagine it dries out more easily than a shorter planter box? Great tutorial. 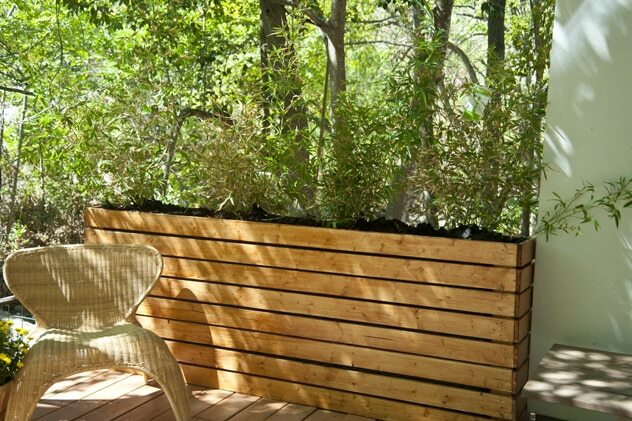 Looking forward to breaking down my pallets and building some custom planters for my dreary London back yard. I built this in under an hour with my pnuematiC nailer, wood glue, and my miter saw. I used cedar fence pickets at a whopping $1.45 a board which come pressure treated. For the sides i used construction screws for a sturdier build. It turned out beautiful, thanks for the great idea. Where did you get cedar fence pickets for 1.45 a board? I was wondering the same thing! Was thinking maybe you could put a few holes in the liner, with hose attached to drain? Trying this this weekend as a cafe barrier for a restaurant I’m opening. wish me luck. Thanks for the instructions! Have you had any problems with the bamboo roots PUSHing OUT AND damaging the planter as the bamboo has grown? Love this idea! I’m going to give it a Go over the weeKend. My first buildiNg project. ExcIted!! These directions are inaccurate and just cost me time & money- you either have the bottom board too narrow or else too short. why do your directions have the bottom board (81 inches) two inches shorter than the side pieces (83 inches)?? upon reviewing your picture it looks that the bottom board should be the same length. ugh. Mike. I just bought all of the wood-AND HAD IT CUT. I AM Not a CARPENTER. WHAT ARE THE PROPER DIMENSIONS? CAN THIS WORK WITH THE DIMENSIONS GIVEN? HOW? THANK YOU FOR ANY HELP YOU CAN GIVE. I came across this project and read the reviews of Those That called out the author for dimensions…. buy I also read…..
I’m embarrassed for those of you that blamed the author… do your own research and measuring… Stop being lazy. I have not started this project as of yet but I find your illustrations and the step by step wonderful. This is exactly what I had in my mind to build to dress up my backyard which is all pool and needs some greenery. Wonderful job author. I hope mine turns out as nice as yours. This is exactly what I was looking for, I just couldn’t picture how to put it together. Thank you so much! It is beautiful and I love that you took the initiative to figure it out — and that you have something beautiful that you can be proud of. I’m a fan of pocket hole joinery, I’d like to try it with this project. I love bamboo! Would probably not put in drainage holes in order to keep bamboo from spreading. Nice job!! I love this concept, and as a newbie, can’t wait to try it out. Thank you for giving us a pRoject that isn’t terrifying to consider. Keep up the good work!! Omg. I love this and wIll try to build it as well. Planning to plant alphone Karr bamboo in there but worried that its not wide enough for the bamboo to grow tall? What did you plant? This looks awesome, but wouldn’t it be better to put a baseboard about a foot below the top so that you dont have to use a ton of soil? This is what i had planned to do – a bit concerned that i am going to be buying ten bags of soil to fill it that i don’t need? Not a criticism – genuine enquiry. Rob, what a great idea. Exited to start. Thinking the elevated base will help with drainage too. Rob that’s a great idea. Maybe some stainless steel brackets (to make a shelf and then fit in a sheet if wood for a flat bottom. Or you could put the planter plastic only a foot or 2 down and not all the way to the bottom and secure it, but it might need support hence the baseboard, I’m not sure how sturdy that plastic is, it might rip. This is EXACTLY what ive bEen looking for for some prIVacy on our Townhomes back deck! I plan to plant leMongrass, which GRows 6′ tall and repels mosquitos. THANK YOU for stepping out on a limb and Making this planter! I also didnt want to spend a bazillion dollars on a planter, so im so exCited to Do my ever first diy construction Project! ThaNk you for the pInspiration! 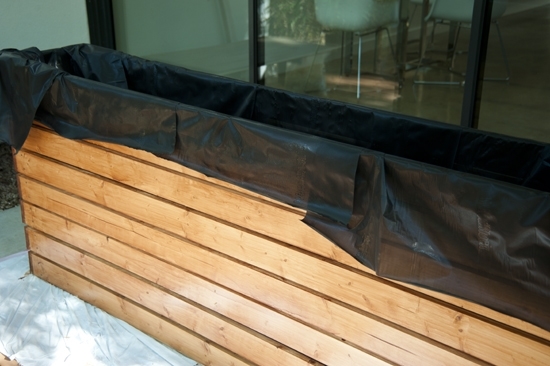 how do you attach the planters fabric and do yo put your own holes on the bottom for drainage? 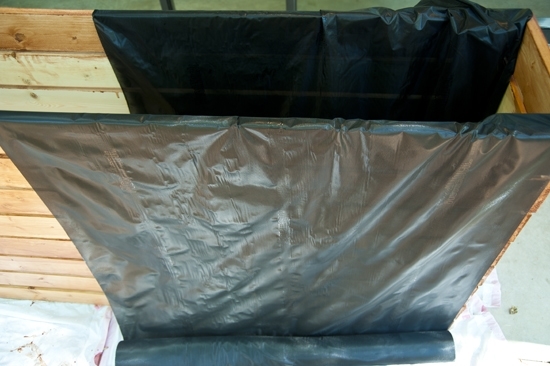 water will drain through the fabric, no holes are necessary, even at the bottom. The fabric just keeps the dirt where it belongs. i’d fill the container with dirt which holds the fabric in place — no attaching necessary. that board at the bottom will eventually rot from water so use pressure treated or cedar. If you haven’t got anyone to help when you nail the sde slats on, try turning the structure on its side and then you have a flat surface with no gravity to pull the unsecured ends down. Hello, how is 96in cut into 4 pieces 27inches?? Just an FYI to AnYONE Considering this – I built one slightly bigger than these plans and my wood bowed. make sure you don’t have the wood too far spaced out from supports and add-in cross-bracing throughout to help stabilize the box. Why do you need a board on the base? Could cardboard be used which would Eventually Decompose? If you’re setting it on top of dirt then go for it. I was setting it on a deck so wanted some space for drainage. Also I was planting bamboo and didn’t want to give it a way out! Why did you use nails instead of screws? I would think using a screw gun would be easier and that the screws would hold a little better. Will make it for sure! 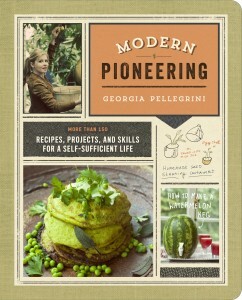 I think the author diD an outstanding job, with what Materials she used. I own several high end Rental Properties That I personally renovated in BrookfielD, WI. (Midwest). I reseArched building a planter box on youtube and online. I wanted to separate each tenaNts half portion of a 36’ deck with a Planter box and with natural greenery versus putting up a fence wall foR privacy. This past week I scratched out on a piece of paper what I wanted to build. If i Bought one like I built it would of been $1000.00 or more, I spend less than $150 using treated lumBer. I purchased Eleven 2x10x8’, Five 2x4x8’. The box is 30” high by 30” wide and 8 feet long. The only boatds I hqd ro cut were the 2×4’s. I used deck screws. It came out fantastic, I filled it with bottle on the bottom and Then stapled landscape material inside. The planter is flush with the actual deck boards So I drilled 10 holes tHrough the wood planter boArds and through the actual deck boArds so it will drain underneath the deCK. I planted 6 ARBORVITAE’S and looks beautiful!! My tenants love it!!! If you would like picTures of the finished planter box build just email me. Your planter box is great,however, I couldn’t help but notice all the negative comments. Anyone who can’t figure out how to cut and build this to their own specifications needs to hire the work done by a pro. There always seems to be a group of people ready to find something wrong with everything! That’s one reason I don’t share my own projects (and their have been many). too many @#$%^&* critics! Thank you for instructions, I just finished mine and it looks lovely! have to paint it now. just wondering how much paint did you used for the entire planter box. I AM IN AUSTRALIA AND THE PAINT IS SO EXPENSIVE. I agree. Always ask for the help of a professional! I couldn’t agree more with this post. You hit the nail right on the head. Keep it up Dude!